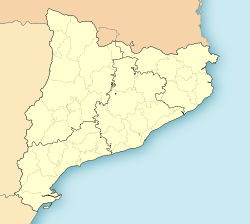 Gallifa is a municipality in the comarca o the Vallès Occidental in Catalonie, north-wastren Spain. Here is the Castle o Gallifa an here wis the location o the studio o ceramic airtist Josep Llorens i Artigas an his son. The Castle o Gallifa owerleuks the veelage frae a hicht o 600 metres. In 1953 Joan Miró an Josep Llorens i Artigas wirkit at Artigas's studio in Gallifa. Thare they creatit "firestanes" whilk they exhibitit unner their jynt names, includin in 1956 a jynt exhibition in New York. The follaein year the twa wirkit on a mural for the UNESCO heidquairters an for the Varsity o Harvard. The tiles that made up the twa murals for the UNESCO biggin wur creatit in Gallifa an Miro supervisit their instawation in Paris. The murals are cried "The Waw o the Sun" an "The Waw o the Muin". The tiles for Joan Miró's ceramic mural (the Miró Wall wur fired in Gallifa an they wur then transportit 1200 km tae the Ludwigshafen museum in Germany. They wur placit fower tae a box so that they coud muivit doun the muntain bi mule. Efter that lorries an the train wur uised tae complete the jurney frae Catalonie tae sooth wastren Germany. ↑ Panareda Clopés, Josep Maria; Rios Calvet, Jaume; Rabella Vives, Josep Maria (1989). Guia de Catalunya, Barcelona:Caixa de Catalunya. ISBN 84-87135-01-3 (Spanish). ISBN 84-87135-02-1 (Catalan). ↑ "The wall by Joan Miró". InterTrans Gmbh. Retrieved 28 September 2011.